Dementia is a decline in a person's ability to think and learn. It is an irreversible mental condition. Occurring mainly in older people, dementia is characterized by memory loss, the inability to concentrate and make judgments, and the general loss of other intellectual abilities. The two most common forms of dementia are senile dementia and Alzheimer's disease. Senile dementia, or senility, is the loss of mental capacities as a result of old age. It is considered a normal part of the aging process, and generally occurs very late in life. Alzheimer's disease, on the other hand, is not a normal result of aging and can begin in late middle age. and delusions. There is no effective treatment or cure for the disease and its cause is unknown. Dementia may result from several other conditions characterized by progressive deterioration of the brain. The three most common of these are Pick's disease, Parkinson's disease, and Huntington's disease. Like Alzheimer's disease, Pick's disease affects the brain's cortex—the outer part where most of the higher mental functions take place. 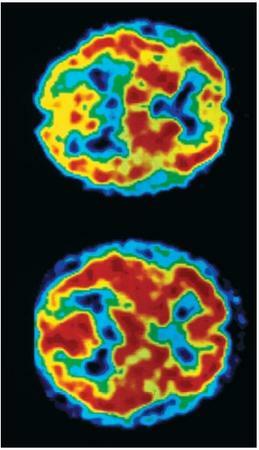 However, Pick's disease affects different parts of the cortex than does Alzheimer's disease. This influences the order in which symptoms appear. The earliest symptoms of Pick's disease include personality changes such as loss of tact (politeness) and concern for others. Loss of language skills occurs afterward, while memory and knowledge of such things as where one is and the time of day are preserved until much later. Both Parkinson's disease and Huntington's disease initially affect deeper brain structures, those that control muscular movements. Symptoms of Parkinson's disease, which begins in middle to later life, include trembling of the lips and hands, loss of facial expression, and muscular rigidity. In later stages, about 50 percent of patients with the disease develop some degree of dementia. Huntington's disease, which strikes in middle age, is first marked by involuntary muscular movements. Shortly after, patients suffering from the disease begin to have trouble thinking clearly and remembering previous events. In later stages of the illness, Huntington patients cannot walk or care for themselves.